This is a Welsh breed, originating from West Wales where it was comparatively well known on small farms. It was Oliver Drake and M C Gower- Williams who developed the breed during the 1920s and by 1941 Charles Roscoe in his book 'Ducks and Duck Keeping' had a section on these birds in his chapter on birds to keep. The breed was standardised in the UK in 1926. It became less popular during the 1950s but the fanciers of the 1980s picked it up again initially in its black and white form only. They were imported into the USA in 1963 by Isaac Hunter of Michigan and recognised in the USA by the American Poultry Association in 1977 where they are considered a rare breed. The challenge for this breed is in producing the even markings and even Charles Roscoe back in the forties was forced to confess that “it requires skill to produce birds that are accurately marked”. If you do decide to breed then it is worth understanding basic genetics and a club specialising in ducks will help you with this. 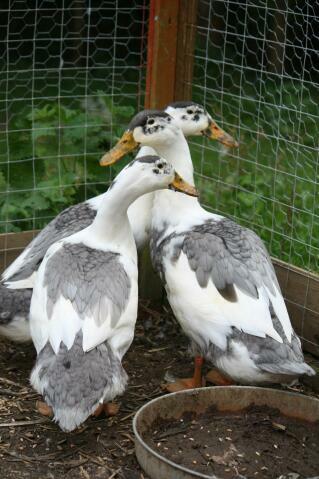 Despite the difficulties in producing good markings, the duck itself is easy to keep. They are good layers at up to 200 mainly white but sometimes blue or green eggs per year and their compact bodies make them suitable as a table bird. Friendly and domesticated, they can make good family pets although their alertness and love of foraging can make them appear flighty. They can fly over low heights but are not good flyers. Classified as a light breed, here are three colours, the black and white, the blue and white and the dun and white. Whichever colour is bred, it is the markings that are all important. The head and neck show a cap covering the whole of the crown to the top of the eyes. The breast and under body are white while the back of the body is solid from the shoulders to the tip of the tail. If you look down at the duck with closed wings, a heart shape should appear to be across the back. In Europe you can also get the duck in chocolate and white and lavender and white.